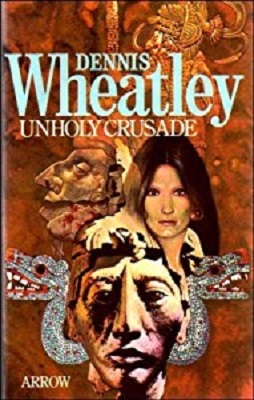 The central character in Unholy Crusade is a man named Adam Gordon. He’s a Scotsman and because he has, at times, had considerable luck, he’s often called Lucky Adam Gordon. In truth though, Adam has had more than his fair share of bad luck as well and he seems to go from one extreme to the other. Adam is a writer and he’s flown to Mexico to try and collect material for a new book. The first chapter finds him sitting in a restaurant, ruminating on his past life and supposed good luck. It is here that the reader learns, via flashback, about Adam’s childhood, the details of how his entire family was killed in a bizarre accident, and how the young Adam fell into the good favours of the wealthy Lord Ruffan. Another interesting thing about Adam that comes up early in the first chapter is the strange fact that Adam believes he has lived before and used to be a Viking called Ord. He even has vivid dreams about Ord’s adventures. He also has dreams about another life, not in the cold Norselands, but somewhere with a warmer climate. A place with pyramids, palm trees and exotic fruits. He has, however, no idea where this place might be. At the end of the second chapter and nearly fifty pages into the book, Adam has an unfortunate accident. He steps into the street and is mowed down by a speeding car. In true Lucky Adam Gordon fashion though, he lands on his feet. Figuratively speaking, anyway. The driver of the car is a man called Bernadino Enriquez, he is one of the wealthiest men in Mexico, and when Adam regains consciousness he finds himself in the back seat of the Bernadino’s car and cradled in the arms of his lovely daughter, Chela. Bernadino ensures that Adam gets the best possible care and when Adam is well enough to leave hospital Bernadino takes an active interest in making sure that Adam has a pleasant stay in Mexico, even going so far as volunteering Chela as his guide. Adam has no complaints about this as he is already heavily smitten by the Spanish beauty. He is also sure that they have met before. In a past life. In that past life though, Adam was destined to be a human sacrifice and Chela, then called Mirolitlit, saved his life. Unholy Crusade is a little over 300 pages long, but to be honest large sections of the book are about the history of Mexico. Even at school, I found history boring and I dislike having it rammed down my throat when I am reading fiction. It bored me and slowed down the pace of the story so much that I ended up just skimming over those sections. Most of these mini-history lessons are not really necessary and what could be achieved in a single sentence or paragraph becomes pages (BIG YAWN). In between all of the history, Unholy Crusade presents quite an interesting story. Not brilliant and not, by any means, one of Wheatley’s best, but it is okay. I am not going to give too much away here, but you will probably not be too surprised to learn that the warm and pleasant country of Adam’s past life was Mexico. As the story progresses, and largely due to Chela’s intervention, Adam gets drawn into a rather dangerous political situation and it looks increasingly likely that, for him, history may be in danger of repeating itself.